Poland's Senate, the upper house of the country's parliament, passed a legislation stipulating the destruction of Soviet monuments in the country on Friday, a Sputnik correspondent reported. WARSAW (Sputnik) — According to a Sputnik correspondent, 70 senators voted in favor, one against and five abstained from the vote on the amendments to the "decommunisation" law against the propaganda of communism or "any other totalitarian regime" in the country. 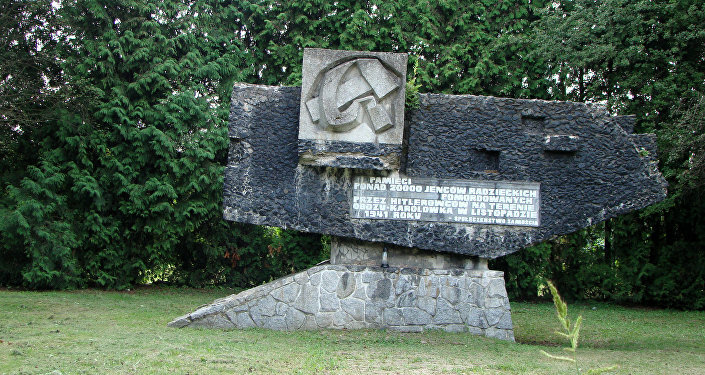 Under the amendments initiated by the members of the ruling Law and Justice (PiS) party, the monuments and memorial stones "praising communism" are subject to demolition. The monuments will be destroyed after the consultations with Poland's Institute of National Remembrance, the correspondent said. The institute's head, Lukasz Kaminski, announced the plan to demolish all Soviet-era monuments except for the ones erected on cemeteries of war graves in late March, according to earlier media reports. Earlier in April, Sergey Nechayev, Director of the Russian Foreign Ministry's Third European Department, warned that the adoption of the law allowing to demolish Soviet monuments by Warsaw could seriously affect the Polish-Russian relations. The "decommunisation" law prohibiting the use of the names that honor persons, organizations, events, and dates symbolizing communism for public spaces was signed by President of Poland Andrzej Duda in May 2016. Reacting to the move Russia's Foreign Minister Sergey Lavrov said that Polish was leading in the "anti-Russia race" with 30 Soviet monuments contaminated and demolished in the country in 2015. According to media reports, there are currently around 490 Soviet monuments located in public places in Poland.